A solar system consists of a collection of objects orbiting one or more central stars. All solar systems start out the same way. 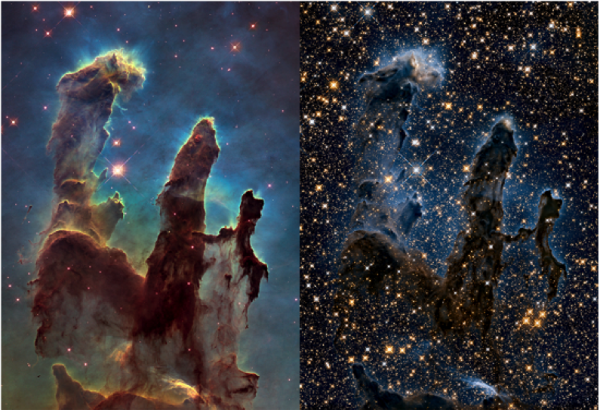 They begin in a cloud of gas and dust called a nebula. Nebulae are some of the most beautiful objects that have been photographed in space, with vibrant colours from the gases and dust they contain, and brilliant twinkling from the many stars that have formed within them (Figure 22.5). The gas consists largely of hydrogen and helium, and the dust consists of tiny mineral grains, ice crystals, and organic particles. A solar system begins to form when a small patch within a nebula (small by the standards of the universe, that is) begins to collapse upon itself. Exactly how this starts isn’t clear, although it might be triggered by the violent behaviour of nearby stars as they progress through their life cycles. Energy and matter released by these stars might compress the gas and dust in nearby neighbourhoods within the nebula. Once it is triggered, the collapse of gas and dust within that patch continues for two reasons. One of those reasons is that gravitational force pulls gas molecules and dust particles together. But early in the process, those particles are very small, so the gravitational force between them isn’t strong. So how do they come together? The answer is that dust first accumulates in loose clumps for the same reason dust bunnies form under your bed: static electricity. 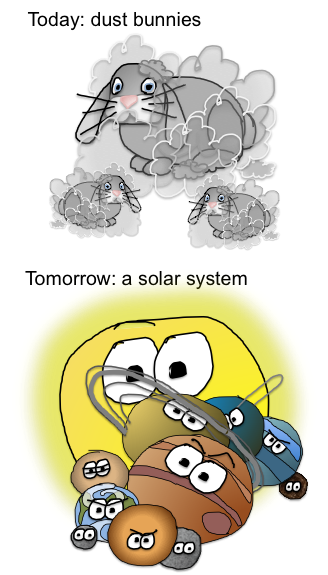 Given the role of dust bunnies in the early history of the solar system, one might speculate that an accumulation of dust bunnies poses a substantial risk to one’s home (Figure 22.6). In practice, however, this is rarely the case. As the small patch within a nebula condenses, a star begins to form from material drawn into the centre of the patch, and the remaining dust and gas settle into a disk that rotates around the star. The disk is where planets eventually form, so it’s called a protoplanetary disk. In Figure 22.7 the image in the upper left shows an artist’s impression of a protoplanetary disk, and the image in the upper right shows an actual protoplanetary disk surrounding the star HL Tauri. Notice the dark rings in the protoplanetary disk. These are gaps where planets are beginning to form. The rings are there because incipient planets are beginning to collect the dust and gas in their orbits. There is an analogy for this in our own solar system, because the dark rings are akin to the gaps in the rings of Saturn (Figure 22.7, lower left), where moons can be found (Figure 22.7, lower right). In general, planets can be classified into three categories based on what they are made of (Figure 22.8). Terrestrial planets are those planets like Earth, Mercury, Venus, and Mars that have a core of metal surrounded by rock. Jovian planets (also called gas giants) are those planets like Jupiter and Saturn that consist predominantly of hydrogen and helium. Ice giants are planets such as Uranus and Neptune that consist largely of water ice, methane (CH4) ice, and ammonia (NH3) ice, and have rocky cores. Often, the ice giant planets Uranus and Neptune are grouped with Jupiter and Saturn as gas giants; however, Uranus and Neptune are very different from Jupiter and Saturn. Part of the reason for this arrangement is the frost line (also referred to as the snow line). The frost line separated the inner part of the protoplanetary disk closer to the sun, where it was too hot to permit anything but silicate minerals and metal to crystalize, from the outer part of the disk farther from the Sun, where it was cool enough to allow ice to form. As a result, the objects that formed in the inner part of the protoplanetary disk consist largely of rock and metal, while the objects that formed in the outer part consist largely of gas and ice. The young sun blasted the solar system with raging solar winds (winds made up of energetic particles), which helped to drive lighter molecules toward the outer part of the protoplanetary disk. Keep your velocity just right. If you move too fast and collide with another body, you both smash up and have to start again. If you move slowly enough, gravity will keep you from bouncing off each other and you can grow larger. Your distance from the Sun will determine how big you can get. If you are closer, there is less material for you to collect than if you are farther away. To begin with, you can only collect mineral and rock particles. You have to grow above a certain mass before your gravity is strong enough to hang onto gas molecules, because gas molecules are very light. As your mass increases, your gravity becomes stronger and you can grab material from farther away. The bigger you are, the faster you grow. In the early stages of the game, the protoplanetary disk is turbulent, and you and other objects can get thrown into different orbits or at each other. This might be a good thing, or it might not, depending on how the rules above apply to you. If the game progresses to the point where there is no more material within your reach and you are not yet a planet, then it’s game over. If you slow down too much (e.g., from bumping into other objects), you could spiral into the Sun (game over). The outcome of the game is evident in Figure 22.9. 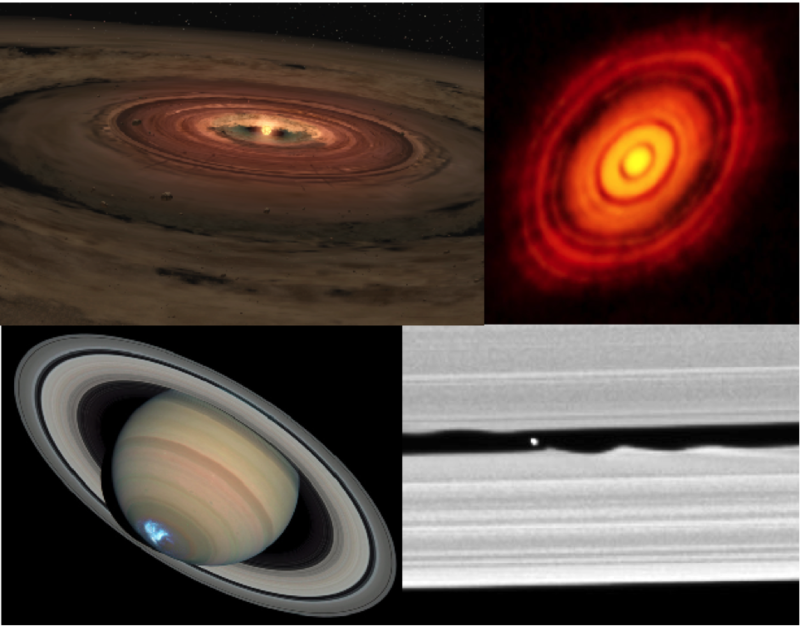 Today eight official winners are recognized, with Jupiter taking the grand prize, followed closely by Saturn. Both planets have trophy cases with more than 60 moons each, and each has a moon that is larger than Mercury. Prior to 2006, Pluto was also counted a winner, but in 2006 a controversial decision revoked Pluto’s planet status. The reason was a newly formalized definition of a planet, which stated that an object can only be considered a planet if it is massive enough to have swept its orbit clean of other bodies. Pluto is situated within the icy clutter of the Kuiper belt, so it does not fit this definition. Pluto’s supporters have argued that Pluto should have been grandfathered in, given that the definition came after Pluto was declared a planet, but to no avail. Pluto has not given up, and on July 13, 2015, it launched an emotional plea with the help of the NASA’s New Horizons probe. New Horizons sent back images of Pluto’s heart (Figure 22.10). 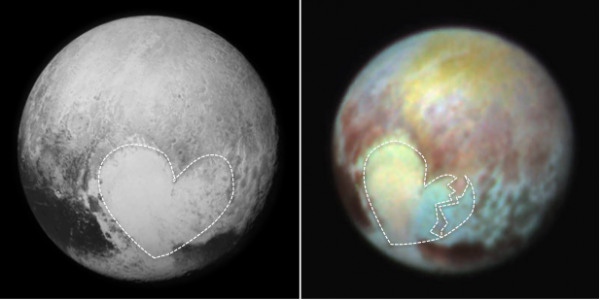 On closer inspection, Pluto’s heart was discovered to be broken. The rules and dangers of the planet-forming game help to explain many features of our solar system today. 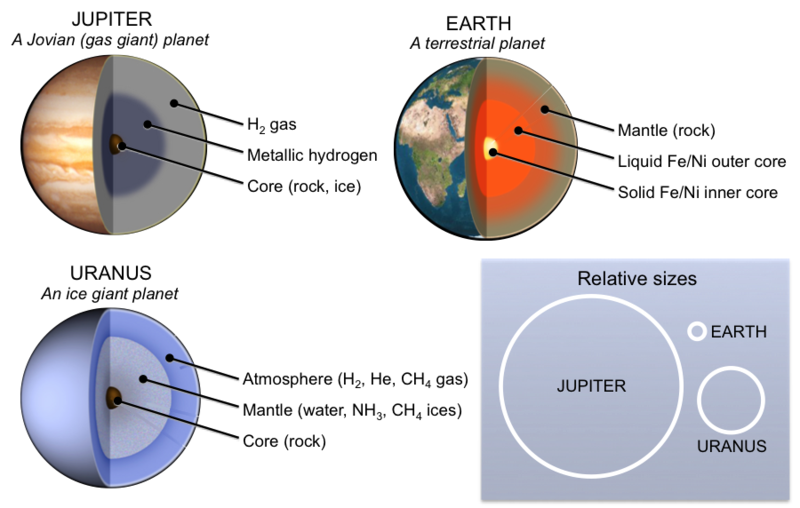 Proximity to the Sun explains why the terrestrial planets are so much smaller than the gas giant and ice giant planets. Mars is smaller than it should be, given the rule that distance from the Sun determines how much material a body can accumulate, and this can be explained by its proximity to Jupiter. Jupiter’s immense gravity interfered with Mars’ ability to accrete. Further evidence of Jupiter’s interference is the debris field that forms the asteroid belt. From time to time, Jupiter still flings objects from the asteroid belt out into other parts of the solar system, some of which have collided with Earth to catastrophic effect. 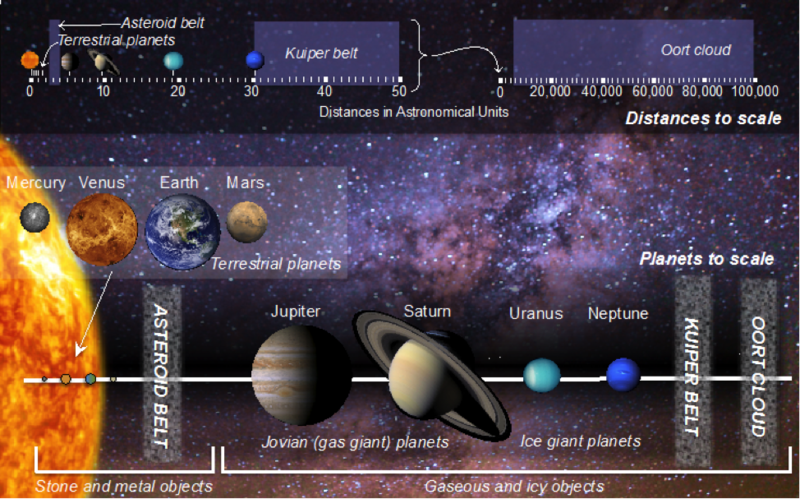 The Kuiper belt is an icy version of the asteroid belt, consisting of fragments left over from the early solar system. The material in the Kuiper belt is scattered because of Neptune’s gravity. From time to time, Jupiter interferes here as well, flinging Kuiper belt objects toward the Sun and into orbit. As these objects approach the Sun, the Sun causes dust and gas to be blasted from their surface, forming tails. We know these objects as comets. Comets may also come from the Oort cloud where gravitational forces from outside of the solar system can hurl objects from the Oort cloud toward the Sun. Exercise 22.1 How Do We Know What Other Planets Are Like Inside? The densities of planets give us important clues about the planets’ compositions. For example, in our solar system, Earth (a terrestrial planet) has a density of 5.51 g/cm3, but Jupiter (a gas giant) has a density of 1.33 g/cm3. We can also use density to determine something about the interior structures of planets. In this exercise, you will determine how much of each terrestrial planet is made up of core, and translate that result to a diagram for easy comparison. Step 1. Find the percent core for each of the terrestrial planets using the data in Tables 22.1 and 22.2. For our calculations the planet density will be the uncompressed density of the planet. Uncompressed density is the density after removing the effects of gravity squeezing the planet together. (Notice that the density we mentioned for Earth is 5.51 g/cm3, but Earth’s uncompressed density is only 4.05 g/cm3.) The first one is done for you. Description Density (g/cm3) Source Why? Core density 8.00 iron meteorite These come from the cores of broken up asteroids and planets and approximate what the density of Earth’s core would be without gravitational squeezing. Rocky mantle density 3.25 HED* stony meteorites HED meteorites come from the rocky mantles of asteroids and planets that have separated into mantle and core, and then broken up. These approximate what the density of Earth’s mantle would be without gravitational squeezing. *HED stands for the names of three types of meteorites: howardites, eucrites, and diogenites. Step 2. Once we have the percent of core, we can use it to find the volume of the core for each planet. The core volume is the percent of core times the volume of the planet. Use the planet volumes in Table 22.3 to calculate the core volume. Record your answers. Step 3. We can get the radius of the core from its volume by using the formula for the volume of a sphere (volume = 4/3pr3, where r is the radius). This calculation is done for you in Table 22.4. From these values, express each radius as a percentage of the total radius. To do this, divide the core radius by the planet radius and multiply by 100. Using your results, fill in the diagrams at the bottom of Table 22.4 by drawing in the boundary between the core and mantle. Diagrams represent a wedge of the planet from surface to centre. The distance between each tick mark is 5% of the radius. One of the terrestrial planets is thought to have been involved in collisions that resulted in the permanent loss of a substantial amount of its mantle. You might be able to guess which one it is from the uncompressed densities of the planets. It should also be clear from your diagrams. Which planet is it? 22.3 How to Build a Solar System by Karla Panchuk, Department of Geological Sciences, University of Saskatchewan is licensed under a Creative Commons Attribution 4.0 International License, except where otherwise noted.